In stock 100 items in stock. For a good look at dry times between several condictive inks, take a look here: http://youtu.be/wqvFT4qTNm8?t=54s. Got one of these from the Kickstarter. They work really well and the ink is really durable. My 4yo daughter can use it with little help and has learned a lot about electricity (and power outage!) thanks to this neat product. 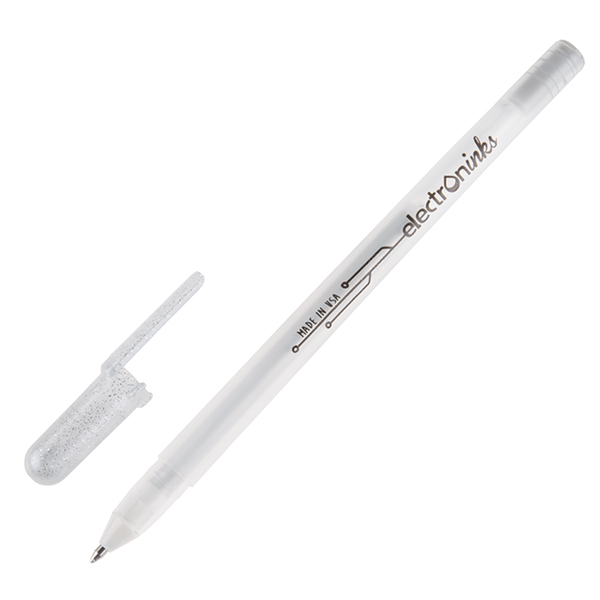 The ink does not smear and dries almost instantly; it's like using a croyola felt pen. Strange question, but has anyone tried soldering to it? I'm using this for a project and I would like to be able to solder directly to it. I was wondering if this could be used to short out a portion of the resistance track in a potentiometer? For example, guitar volume pedal pots only move about 1/4 turn. They can rotate over the full range, but when installed in the volume pedal, the linkage only moves it about 90 degrees. So they make these special pots, which are expensive and hard to find and take a long time to get. The resistance track is only over that 1/4 turn, and then the rest of the way around is close to a short. Obviously you have to pry the back cover off to see all this. So I'm wondering if I good use this pen on say a 1Meg linear pot, and draw over 3/4 of the turn (OK a little less, since it's not 360 degrees), and end up with one of these special pots? Has anyone tried washing it? I was thinking of using it on a soft circuit instead of conductive thread, but I was wondering how it holds up in the wash. So if you go over the line multi times (vertically stacked, or horizontally thick) does it reduce the resistance?